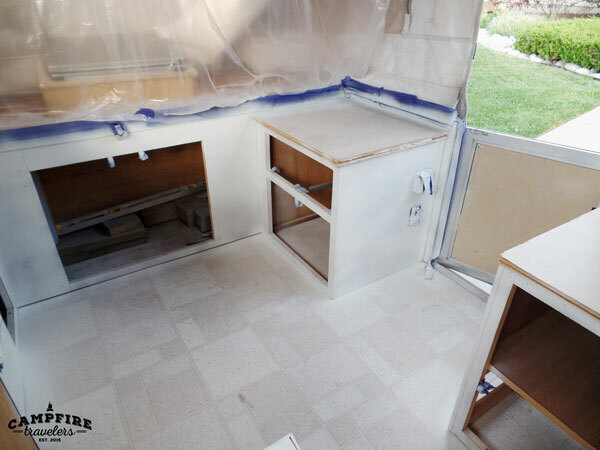 Now that the canvas is sparkling white we are moving onto the cabinets in our new to us 1999 Palomino Stallion pop-up camper. The late-90's fake honey oak was just not what we had in mind. 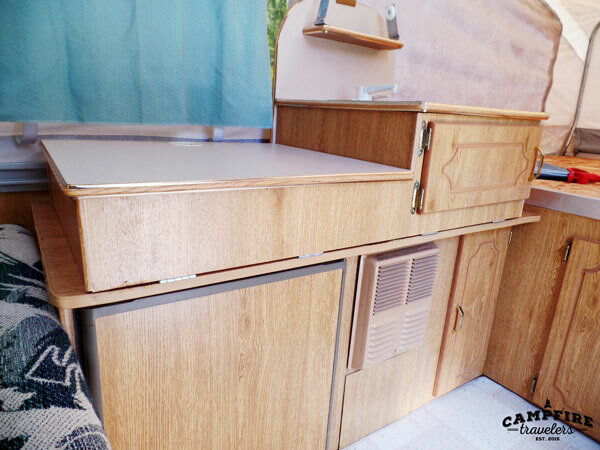 The cabinets themselves, just like everything else, had not been well maintained and really needed some repair and a face lift. Having painted our cabinets at home we knew what we were in for. It's a tedious process and often need touch ups in the long run, but painting is definitely the fastest and easiest solution for our project. Because these are laminate cabinets sanding won't help and will leave marks. 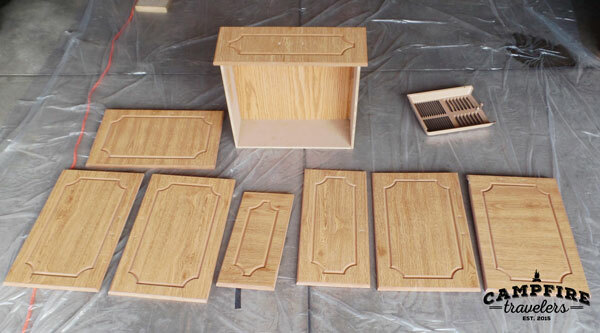 And unfortunately a cabinet scrubber like a TSP wouldn't have worked for us because our cabinets did have exposed (particle board) wood in the grooves as part of the design. In the end, we scrubbed the cabinets the best we could and said a little prayer. We made minor repairs using wood glue and clamps and we're able to get everything back in working order before moving on. Now let me tell you, we were on a serious time crunch - our first camping trip in the pop-up was 19 days away and due to our HOA CC&R's we couldn't have the camper outside more than two consecutive days at a time. 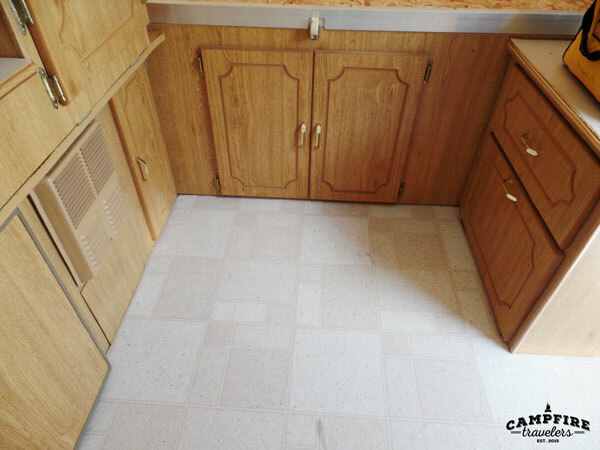 Because of our limitations we decided to only remove the cabinet doors instead of the whole cabinets altogether. We taped and sealed and protected and got started with a Zinsser spray primer. Side Note: If you don't have much experience with spray paint you should read up first!! Low and slow is the key. Don't try to cover it all the first coat. There are some great DIY tutorials out there. I like this one andthis one. We decided to go with spray paint because of some issues we had in our kitchen at home with brush marks and getting into the corners. But during a few other home projects we had great luck with spray paint. 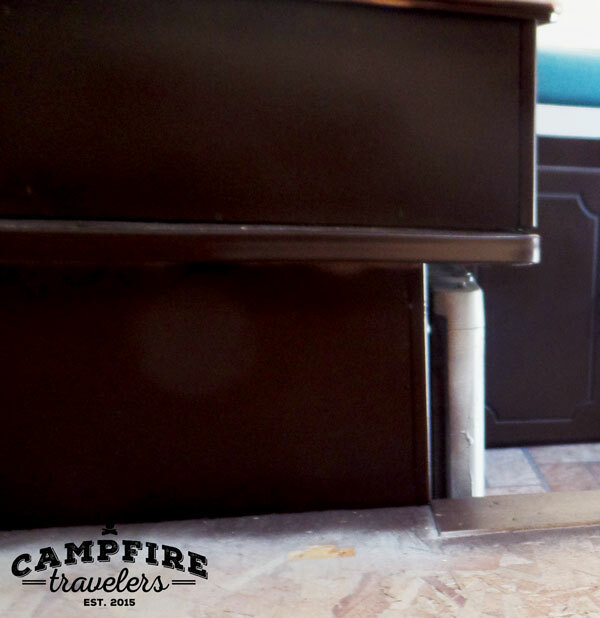 So we found a satin espresso Rust-Oleum from Home Depot that matched well to our inspiration. I will tell you we went through a ton of spray paint! About 5 cans of primer, 10 cans of espresso and 4 cans of clear sealer. And keep in mind we really have a lot fewer cabinets than most pop-ups. We easily spent $200 on spray paint. If you are on a budget, spray paint is not the way to go!! Would we use spray paint if we had it all to do again? Yes. I really like the coverage better. And we ended up painting the rubber/plastic molding plus a few other things and regular paint wouldn't have adhered like spray paint. We still need a few touch-ups and in different lighting we see different issues. But over all the spray paint is holding up well and is cleaning up well. Which is the most important part! The clear coat we did after made the difference of being able to clean the cabinets with a quick swipe of a Clorox wipe. The biggest transformation I think came from a few of the other pieces we spray painted - hardware, the furnace cover, and a few other things. Come back soon and we'll talk about those!